[i am a dekaphobic]: Project Pie: Create Your Own Pizza! #6: Grilled Chicken, Sliced Red Onion, Cilantro, Mozzarella, Gorgonzola and BBQ Sauce. #7: White Pizza with Prosciutto, Caramelized Onions, Mozzarella and Parmesan. You can still add other toppings to the pre-set pizza. Fantastic! My friend's pizza has Red Sauce, Italian Sausage, Bacon, Grilled Chicken, Green Bell Peppers, Feta, Mozzarella and BBQ Sauce. We each had Refillable Coca-cola drinks and China Mist Iced Tea for Php 65. Their iced tea is pure tea, but they have sugar on the side to make it sweeter. To end our lovely dinner, we shared one of Project Pie's dessert pizzas: Banana Nutella (Php 145). Banana Nutella Pizza has banana slices, cinnamon powder and Nutella (!!!). If I wasn't that full, I could devour the whole thing. It was delicious! Other dessert pizzas are Peanut Butter Nutella, Strawberry Mango Nutella and Cinnamon Sugar with Icing. Project Pie also has salads, beers (both local and imported) and even wine. The pizzas are served quickly as their ovens can bake pizzas in around 4 minutes, the staff was well-trained and are very engaging. However, they have a problem with space. Although our group was lucky enough to score a table, it wasn't quite comfortable as I can't stand up freely to refill my drink that my friend had to do it for me. Maybe some table arrangements could be done, or maybe the ordering system could be changed. Nevertheless, we had a great time with our pizzas at Project Pie. The prices are reasonable enough and the service was impressive, but maybe I'd go back during off-peak hours instead. 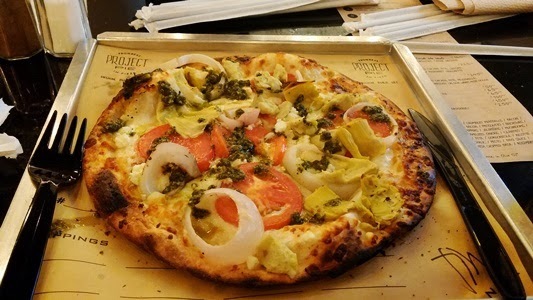 Have you been to Project Pie? What are your favorite pizza toppings? Wow! Now I'm curious more than ever to try this one out! I'm surprised that even if this was launched several months back, it still has a lot of people coming by. I'm waiting for the Eastwood branch to open! I'll be making pizzas with lots of bacon!!! Oh my...hindi ko pa na-try jan pero sana after feb 2... hehehe... exciting ang place! PS: How was the pizza crust? Bf has been to Project Pie already, but he was complaining about how charred the pizza crust was. I honestly haven't been to other branches. We only went to the Shaw branch because it's the nearest from the office. Hope you'll have a great time!